Android applications or apps are made up of Activities. The Android Activity class android.app.Activity is core to any Android application. Typically, one Activity is displayed at a time and this Activity occupies the entire screen. Each Activity is made up of views, which are the most basic building block of a user interface. The View is a base class for objects that interact with the user; they are called widgets (TextView, EditText, ImageView, Button, etc.). In this tutorial we'll discuss the common terms used in Android UI development: activities, layouts, views, and widgets. There is no main function defined for Android applications so the Android system launches applications with the defined launcher activity, which serves as the entry point for the application. When the application is launched, the Android operating system application manager uses the Main Activity to start the application. The Main Activity is the first activity users see. Every instance of Activity has a lifecycle. During this lifecycle, an activity transitions between various states. For each transition, there is an event that notifies the activity of the change in its state. 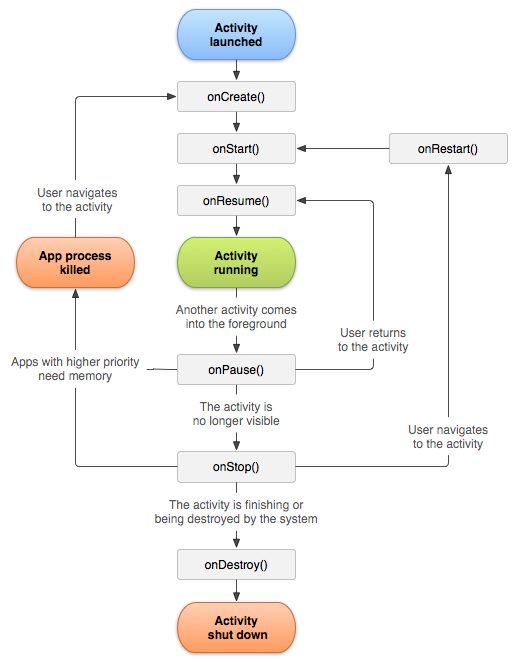 Android activities have a defined lifecycle to manage application runtime from launch to the end of application life. The Activity base class defines a series of events that govern the life cycle of an activity. onCreate() : Called when the activity is first created. This is a place where we usually do main UI elements initialization. onResume() : Called when the activity starts interacting with the user. At this stage we can start any services or code that needs to run while your activity is in the foreground. onPause() : Called when the current activity is being paused and the previous activity is being resumed. This is a good place to save all the information you will need when you resume again. If there are any unsaved changes, you should save them here. At this stage we can stop any services or code that does not need to run when your activity is not in the foreground. onDestroy() : Called before the activity is destroyed by the system. At this stage we should free up resources before the activity is destroyed. onRestart() : Called when the activity has been stopped and is restarting again. For example, you turn off your phone screen (lock it) and then unlock it again. By default, the activity created for you contains only the onCreate() event which helps the Activity to display the UI elements. To understand the various stages of the activity, we'll implement all the events, and define our own log messages for each event, and then subject the activity to various user interactions. Run your app on virtual or real device (read How to setup emulator to run virtual device and Run your app on a real Android device). Open Logcat window from the main menu View > Tool Windows > Logcat or click Logcat tool button from the bottom of Android studio. Select your device from the logcat menu and filter logs by searching the TAG value: Lifecycle, as shown in following image. Above example shows, an activity is destroyed when we click the Back button and whatever state the activity is currently in will be lost. The onRestart() event is now fired, followed by the onStart() and onResume() methods. When an activity is created for the first time, the onCreate() method is called. When an activity is started, the onStart() and onResume() methods are always called, regardless of whether the activity is restored from the background or newly created.